While shopping at NordstromRack, I found this fun pleated peplum sweater. Have you ever purchased a piece with the intent of discovering various ways of styling it? What can I pull from my closet to give it just enough edge to be interesting? I am wearing an old pair of Ralph Lauren deep wine colored, cotton skinny jeans. I pulled this cotton scarf from my scarf drawer which combined the same blue and wine colors. I am covering up the sweater's scoop neck. And, of course, my fold over cowboy boots (a name I made up) complete the look. The pleats hit below my waist in front and then scoop down in back. AND.......there you have it. My new look taking old "stuff" from my closet and adding the new. I could put it with a denim skirt, boots and a red/white and blue small square scarf tied around my neck like a choker. 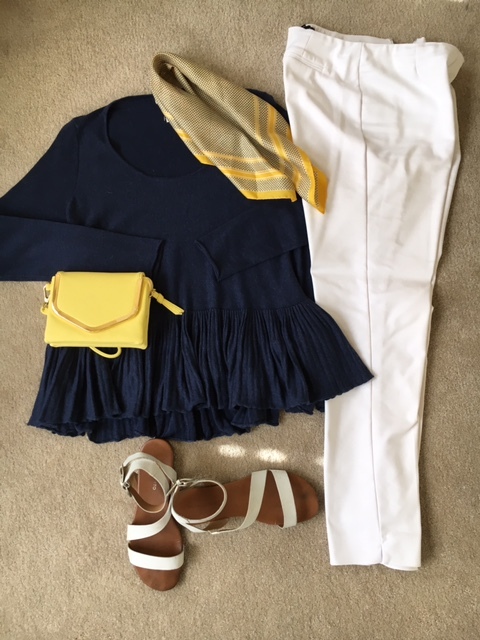 Since it is very light weight (cotton/rayon blend) I paired it with white capri pants, strappy sandals and yellow accessories. I get four great looks! 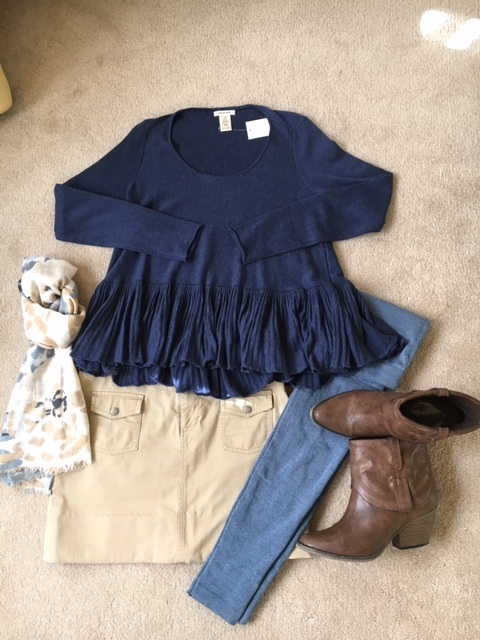 It doesn't take a bunch of money to look "put together"
Have you got some ideas for this awesome sweater find?